In a radical departure from my usual approach to presenting a performance piece, I staged an interactive performance with no prior announcements! 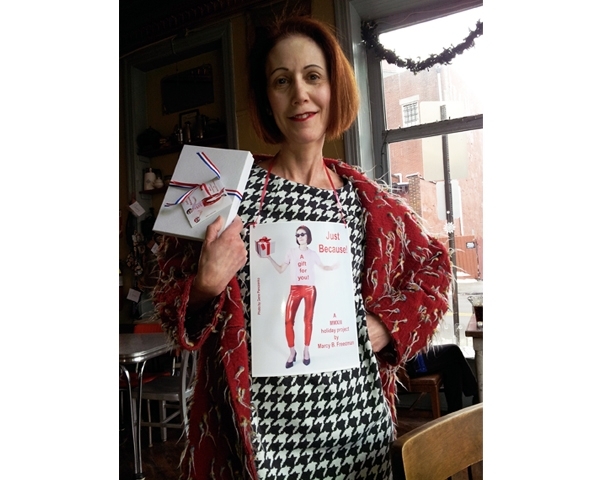 On Saturday, December 21, 2013, I went to two coffee shops and handed out about four dozen wrapped gifts to the surprised patrons of The Black Cow in Croton and the Peekskill Coffee House in Peekskill, NY. Whenever someone asked me why I was doing this, I simply replied, “Just Because!” Prior to this performance, I was strangely nervous. Somehow, employing this guerilla-style approach to performance was unnerving! Indeed, I rarely experience “stage-fright” when appearing in public, but this situation was new to me — and invigorating! I may have to utilize this surprise tactic again!